Making Mealtime Magic for Older Adults in Health Care Communities - Becky Dorner & Associates, Inc. I do my best to stay positive in my communications however, I have to say that I was sadly disappointed in the meal service during a recent visit to a nursing facility. Was it because it was a Saturday evening meal and they had less staff? Is that an excuse for serving soggy, ground up pizza and overcooked mushy green beans to a person who is unable to articulately communicate her dislike of the food? Certainly not. Are your customers satisfied with their dining experience? 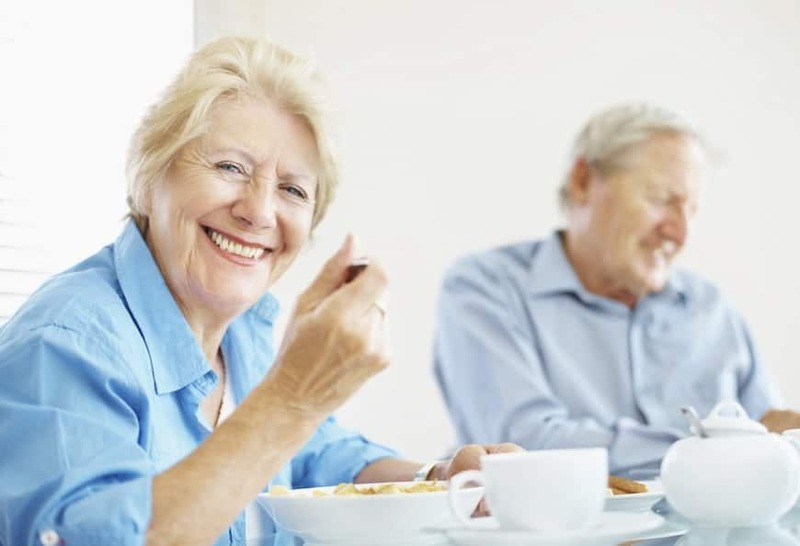 National surveys in nursing facilities have indicated that almost a third of residents are unhappy with the food, and almost a quarter are unhappy with the dining experience. Food/meal satisfaction is considered a quality of life marker, so attention to satisfaction is critical. After all, food is a major part of daily life. It’s much more than nutrition and hydration; it’s an important part of psychological, social, cultural, religious, and family traditions. Aromas, flavors, and textures of food can brighten someone’s day by eliciting happy memories, and providing a feeling of comfort. Residents also have the right to refuse therapeutic or mechanically altered diets, ask for a meal replacement if they dislike the food, and most importantly, they have the right to be treated with dignity and respect at meal time. Meals are an important part of the culture of any health care facility and are usually highly anticipated by residents. By one estimate, roughly 60% of the average resident’s day revolves around preparing for, attending, and returning from meals. Dining should focus on individual choice and provide person-directed care. Today’s health care consumers are accustomed to choice, and they often have very specific food preferences and dietary habits. Meeting individual needs can be a challenge, but it is essential to maintain health and well-being. Providing excellent customer service involves knowing who your customers are and what they want. As the baby boomer population ages, residents entering skilled nursing facilities for rehabilitation and short term stays will most likely have sophisticated palates and be accustomed to excellent customer service. They won’t hesitate to complain about poor quality meals. So why not invite comments and seek input for your menus and meal service? Customer service and hospitality training can help improve customer service. Concerns or complaints should be taken seriously and addressed in a timely manner. Staff assigned to the dining room should: be trained to find the best solution for each individual complaint, encourage residents to eat and cue or assist residents with dining as needed, and retrieve items that are requested. If table service is provided, they should be trained on proper procedures for waiting on residents. Short staffed? Consider cross-training staff from other departments to assist with meal service: serving food, opening containers, cutting food, for residents who eat independently. This allows trained nursing assistants more time to help those who need more assistance to eat the meal. High quality food temperature is essential to keeping customers happy. Assure that meals taste good, are served at the right temperature, have a pleasant aroma, are nourishing, and satisfy special dietary needs, cultural and/or religious preferences, and food preferences. There are many aspects involved in preparing and serving quality food. A dining services manager who is passionate about food and service is also enthusiastic about leading staff to make quality improvements: encouraging cooks and food service workers to keep their skills up to date, providing regular education on food preparation and presentation, and encouraging staff to create new ideas for foods and recipes that residents will love. If possible, consider bringing a chef in to your facility to train staff, or even hiring a chef to enhance the quality of the food. Preparing food safely. Maintain proper storage, cooking, and holding temperatures; assure staff are well-trained in safe food handling practices. Cooking and seasoning food properly so it isn’t overcooked or undercooked. (Always taste and approve foods prior to service). Assuring food is plated attractively, using garnishes to enhance the appearance of the food as appropriate. Use liberalized diets where appropriate to help make food more flavorful and appealing. Individualize diets to meet residents’ personal needs and desires. If therapeutic or mechanically altered diets are needed, foods served should be just as flavorful and attractive as the food served for the regular diet. Parts of this article are excerpted from Making Mealtime Magic with Person Centered Dining.